One of the most successful textbooks in pediatric dentistry, DENTISTRY FOR THE CHILD AND ADOLESCENT, covers all areas relevant to the specialty of pediatric dentistry and general dentistry for children. Comprehensive discussions on examination, development, morphology, eruption of the teeth and dental caries are provided. A chapter on nutritional considerations begins with fetal development and infancy and advances through childhood and adolescence. DENTISTRY FOR THE CHILD AND ADOLESCENT discusses the dental health implications of problems such as anorexia nervosa and covers the psychological approach to behavior guidance. Additionally, a chapter on pharmacologic management follows the anesthesia guidelines established by a joint committee of the American Academy of Pediatric Dentists and the American Academy of Pediatrics. * Follows academy approved guidelines for the use of anesthetics in the treatment of the child patient as well as outpatient vs. in-patient procedures. * Provides the reader with an overview of practice management including patient scheduling, insurance, and third party plans. * Includes information related to the importance of the diet survey to determine the adequacy of the diet including intake of vitamins and trace minerals. * Provides the reader with the latest information on severe birth defects such as cleft lip and palate. * Includes dentists' guide for documenting and reporting child abuse and neglect. * Provides valuable information on cavity varnish, mercury toxicity, and glass ionomer cements. * Provides indications for the use of implants to replace teeth (congenitally missing or lost as a result of trauma) in pediatric patients. McDonald DDS MS LLD, Ralph E.; Avery DDS MSD, David R.
2. 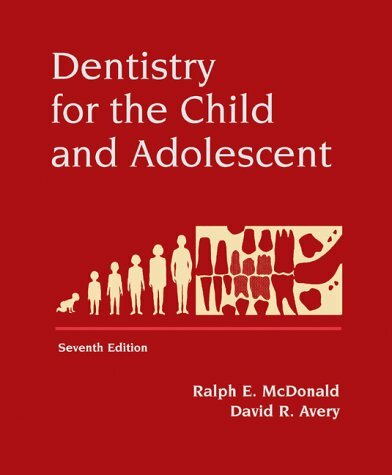 Dentistry For The Child and Adolescent 7th ed.